Hard to find 1.5 Acre horse property close to town for under 425K! Quintessential Colorado living with welcoming front porch, two large pastures, shed, single stall barn with chicken coop, hay storage & fenced front yard. 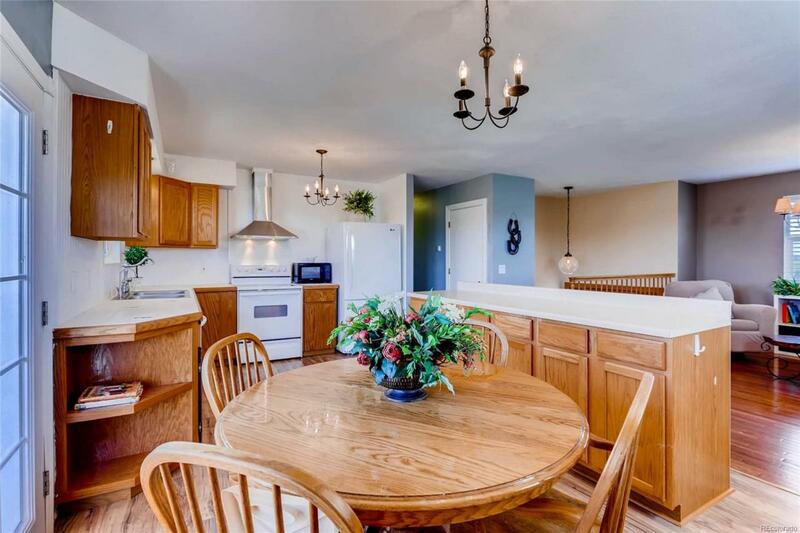 Charming eat-in kitchen boasts beadboard backsplash, island with plenty of storage, newer stainless hood vent & large pantry. Open concept kitchen/living is perfect for entertaining. Beautiful french doors off kitchen open to back deck for added living/dining space. Main level has wood flooring & includes Master retreat with full bath and walk-in closet. Two secondary bedrooms and additional full bath also on main. Finished lower level living area is cozy and inviting with tongue & groove ceiling & lots of natural light. Over-sized 2 Car Garage has built in shelving & exterior access door. Brand new Harmon Pellet Stove with Programmable Thermostat. Updates: New ext and int paint, recent barn finish out and chicken coop, newer Milgard windows, roof and gutters. NO HOA.